Hop growing and drying shared in the leap forward of agriculture in 18th Century Britain, especially in the second half of the century when the growing population in towns and cities increased demand for beer. The Farnham area on the Surrey-Hampshire borders saw string growth in the 18th Century and the development of new hop varieties. Brewers used about twice the amount of hops in their recipes than they would today. Samuel Trowell in 1739 records that hops “are become an universal commodity for preserving of beer, though formerly very much decried“. The Dublin Society say that “if only 75 gentlemen would enter heartily into this affair” it would greatly benefit Ireland. Writers extol the benefits of hopped beer as well as the benefits for the Exchequer from the Duty and the financial gains for the hop grower. They also emphasise the crucial role of good judgement in timing of picking and drying. “Nothing is so easily damaged as hops in drying if perfect fragrance and good colour” are to be preserved, wrote Thomas Hale in A Complete Body of Husbandry, 1751. However, there were also dissenting voices. A 1775 book of Hints to Gentlemen of Landed Property said the “the business of cultivating hops and farming is incompatible; each require constant attention”. The available evidence from existing buildings about oasts in the 18th Century is frustratingly thin and unclear. 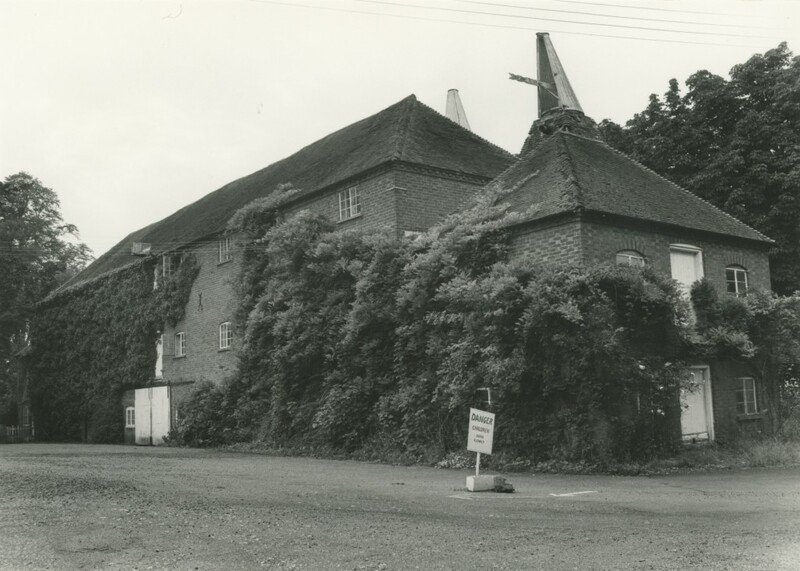 Much hop growing and drying remained in small scale units; for example in the Parish of Goudhurst in the Weald in 1714 there were 31 different growers of hops with only 37 acres between them all (Cordle, p8). Many oasts were on farms where hop growing was responding to increasing demand, so farmers replaced old buildings with new ones. The intense period of oast building in the first half of the 19th Century swept away much of what had gone before, leaving large gaps in our knowledge. Fortunately a more vivid picture emerges from books of the time. Writing on agriculture and the countryside was prolific. Works on hops and hop drying include The Riches of the Hop Garden Explained, 1724 by R Bradley, a Professor of Botany at Cambridge University, Instructions for Planting and Managing Hops, 1733, published by The Dublin Society and A New Treatise of Husbandry by Samuel Trowell, 1739. Although The Dublin Society book states that in drying “lyes the greatest Difficulty and Art in the Management of Hops”, oasts/h op kilns are given only modest space. 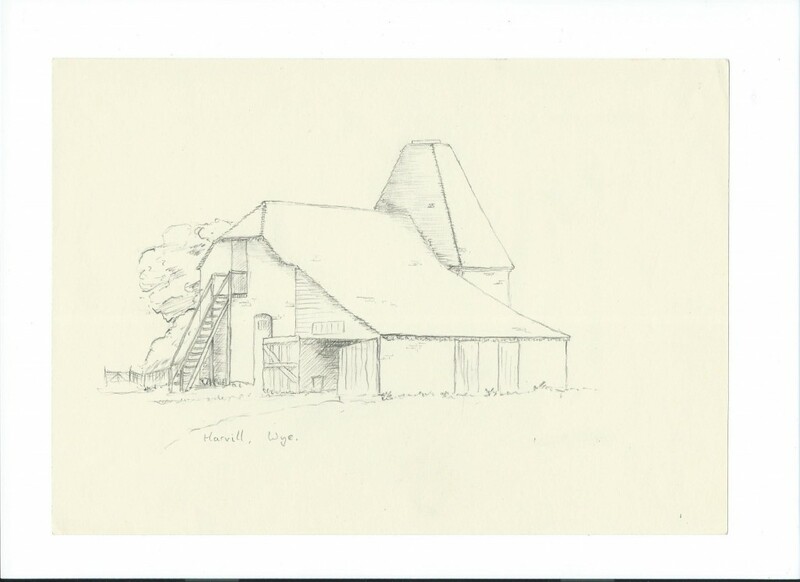 Small and Large: above, a typical modest Wealden single kiln oast of the 18th and early 19th Century Harvill Farm, Wye, Kent. 1960 drawing. Below Swarling Manor Oast near Canterbury. Late18th Century. 1960 photo. At the beginning of the century oasts were typically small buildings with one kiln, most commonly set inside an adapted farm building. John Mortimer in The Whole Art of Husbandry, a popular 2 Volume which went through several editions in the early 18th Century suggests that kilns were getting larger, for example up to 12 foot square. By the end of the century some oasts were magnificent brick buildings with a large stowage and up to 5 or 6 tall kilns topped by cowls. Increased urbanisation during the Industrial Revolution contributed to demand for beer. Hop growing and drying, well established in the Weald of Kent and Sussex grew strongly in north and east Kent. At the end of the 18thC Edward Hasted in his multi volume History of Kent was lyrical about the benefits of the hop business, even for the aged and infirm who manufactured the bagging. Parish records indicate that the custom of itinerant hop pickers lodged in sheds by the hop gardens became a well established feature of the hopping season at this time.In the mid 18th Century hops were being sold at 25 markets across the country (William Owen, Book of Fairs, 1765). William Marshall described the area around Maidstone as “a forest of hops”.Daniel Defoe in his account of travels around Britain in the 1720s noted the spectacular increase in hop gardens around Canterbury, some 6000 acres within a few miles of the city. He asserted that older residents of Canterbury in the 1720s could remember a time when there had been no hops in the district. Daniel Defoe also reported from Hereford “as for Hops, they plant abundance all over the county “. Other writers describe regional difference in hop growing between Kent, Surrey, Hampshire and the West Midlands. Technological advances arrived in the 18th Century, even though old and simple methods of charcoal or smokeless coal fired drying remained widespread. It is not certain when hop kilns started to be built of brick, rather than wood and plaster, but it is likely to have been in the early 18thC. By the middle of the century Thomas Hale in his book on farming advises building a brick room 19 feet square with a 5 foot long fire in the centre. The drying floor of 1 inch square rails should be 4 feet above the top of the fire, and the brick walls should be built up a further 3-4 feet above the drying floor to keep the hops in.This last instruction implies that there was not yet a wall right up to the vent in an inverted cone. The Dublin Society which existed to promote new learning recommended “a new instrument in a long slender hollow tube”, the thermometer to help the dryer. John Mills suggests with a thermometer “any servant will be able to mend and correct the fire with great certainty and not be liable to commit a mistake”. Hop growing and drying had started in the Farnham area of Hampshire and in Hereford and Worcester in the West Midlands in the 17th Century. John Beale published in 1657 his Herefordshire Orchards, including the best method for planting and managing a hop garden. He also described his work as providing a pattern for hop growing in Ireland and a later edition of the book was published in Dublin in 1724. From early on there seems to have been a competitive spirit between these smaller hop growing districts in relation to Kent and Sussex. Beale wrote in 1657 we must “make haste to be the chief Hop Masters in England” with the best soil, charcoal and farmers, especially around Bromyard. Early hop planting was in the valley bottoms but farmers soon found that hops did better on the sloping sides of the hills. By the 18th Century growers and dryers in both Hampshire and the West Midland reckoned they were the best in the country. But as small scale brewing went on across the country hops were widely grown on a small scale grown in a many other counties They featured in Nottinghamshire early in the century and in 1789 around 200 acres of hops are recorded in Suffolk. The political profile of hop growing and drying increased. In 1710 a duty was imposed on hops for the first time, 1d per pound on English hops and 3d per pound on foreign hops, thus protecting and boosting the domestic crop. From then until 1872 Excise Officers visited oasts to weigh pockets and verify against fraud. Their records and the reports of the Commissioners of Excise are an important source of data about the industry, if not directly about oast houses. In 1774 an Act of Parliament required dryers to stencil on hop pockets at the oast the growers name, year and location in order to reduce the risk of fraud. Yet the economics were volatile. Commentators were preoccupied by the high risks as well as potential high rewards. Arthur Young a pre-eminent travel writer and farmer of the 18th Century described hops as a mere lottery, and enchanting vision which cast a spell over farmers .Well known writers on agriculture and the topography of Britain described them as a gamble that could drive farmers mad. In years of poor returns, for example 1792, there were protests to Parliament against the Duty.